The Voom 20 is a 20 watt Bluetooth splash proof speaker system with a number of perks that makes it kind of special. The most outstanding feature, besides its rich sound, is that you can connect two smartphones at the same time. Once this connection is done you just need to pause the music on one to instantly start playing your music from the other smartphone. I never saw an iPhone and a Samsung work so well together. I will list all of its features later on in this review. The Voom 20 has a great sound even though it has a small foot print. It measures only 7 1/2 inches long, 2 1/2 inches high, and 2 7/8 inches deep and it tips the scale at 1 ¾ pounds. See photo 1. It has two 5 watt drivers and a 10 watt subwoofer and two passive radiators. The radiators are used to increase bass frequencies to improve the overall sound of the system. ·It is rated IPX5 on the water proofing scale. This means it can handle any kind of water spray and even survive a soaking from a rainstorm. See photo 2. This rating is not, however, high enough for it to be submerged in water. ·It will provide you with about 10 hours of play time. ·It has a unidirectional microphone built-in so you can go from music to answering phone calls at the press of a button. ·You can also use its built-in USB port to charge your smartphone. 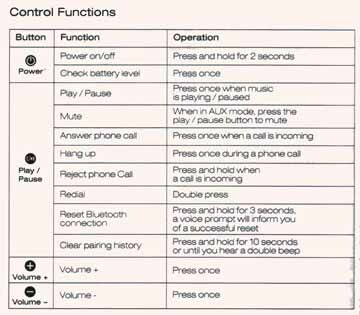 ·If your smartphone has Near Field Communication (NFC) capability you can do instant Bluetooth Pairing. ·As mentioned first you can connect two smartphones at the same time and instantly switch which one is playing your music. ·To see what each button on the Voom 20 does see photo 3. The sound is fantastic and the design is striking. 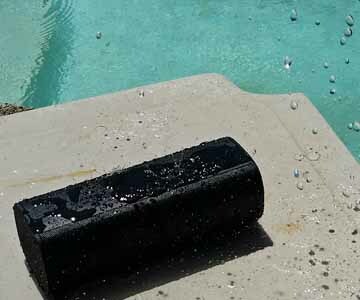 You can use it around your pool or even in your shower because of its splash proof rating. 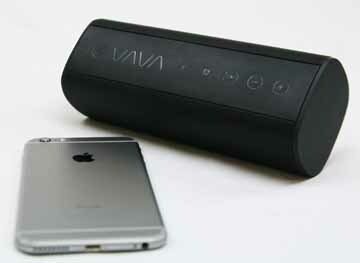 Its multifunctional possibilities make it the perfect speaker for sharing your music and your phone calls with your friends. It comes with a short micro USB cable for charging but no charging block for you to plug it into an electrical outlet. You will need to supply your own charging block, charging station, or plug it into your computer for charging. The entire body is black including the buttons that you press for its different functions. In low light the buttons are very difficult to see. With its black rubberized body the unit, if left baking in the sun, could easily exceed its maximum 114 degrees Fahrenheit operating temperature.